Testament is one of the best thrash bands to survive the 80’s to the present day. The vocals, lyrics, and instrumental compositions have earned them fans worldwide. Many consider them as a band who should be included in the Big 4 and some say they are part of the Big 8. 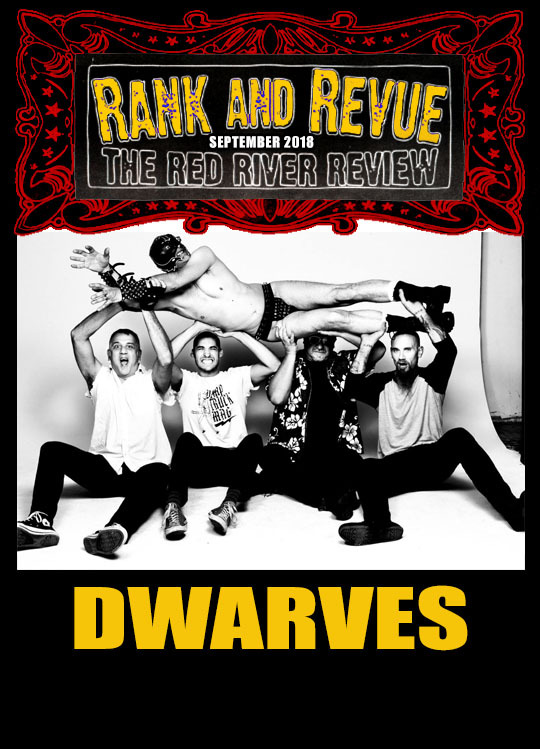 This is their third LP since reforming and releasing new music. I feel out of all the major players in the 80’s thrash scene Testament have probably put out some of the best and most consistent records among their peers in the last 10 years. A lot of my favorite 80’s thrash bands simply don’t exist or are a shadow of their former selves. I feel Testament are masters of blending different sounds they have made over the many years of their existence together. Their mixture of 80’s thrash and death metal is an always welcomed sound for many listeners and something that you don’t hear a lot of anymore. 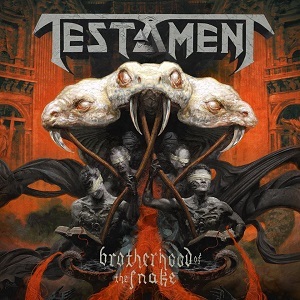 Brotherhood of The Snake – Testament coming roaring out of the gate with the first song on their LP and also the title track. The opening riffs and growling let you know this song is gonna be full throttle all the way through. The lyrics follow the theme of a secret group called the Brotherhood of the Snake. The song is thrashy and the vocals go between shouting to growling. Awesome first song. Pale King – Testament continue the upbeat thrashy sound of the first song with the next song following in suit. I dig the idea and lyrics of this song. It is pretty much a story of the Pale King (An otherworldly entity) coming to our world and wreaking havoc as the earth submits to his control. This song also allows Chuck Billy to do a little more harmonizing all while throwing in some killer riffs. The lyrical concept put to a thrash beat make this song one of my favorites on the album. Seven Seals – Seven Seals is definitely another one of my favorite songs on this album. I really dig the opening riffs. This song is one of the slower ones on the album. The chorus is pretty catchy. The lyrics tell the story of the apocalypse and what happens as each of the seven seals are broken. I enjoy how Chuck gets to use more of his melodic vocals on this song. There are some nice solos and guitar layering on this song. Really cool concept and probably one of the catchier songs on the album. Born In A Rut – Born in a Rut is a pretty cool lyrically and sonically. It is more of a mid-paced song compared to the beginning of the album. The lyrics could be interchangeable in many punk and metal bands lyrics. “I don’t really give a damn I was born to lose. I won’t live forever I don’t need no excuse”. The theme is being born into a hard situation and sometimes having to do things other people would frown upon as well as realizing you only live once so don’t care what people think. Again this song showcase’s more of Chuck’s melodic vocals and another catchy chorus. Centuries of Suffering – Centuries of Suffering is another great song on this album. They speed things back up again to more of a thrash speed and Chuck uses mostly shout/growl vocals for this song. I really like the main riff in this song as well. The lyrics cover the history of war from when people used sticks and stones to the bombs we use now. “What will be the final Answer” growls Chuck as he questions what war will evolve into next. Probably one of the harder songs on the album. Neptune’s Spear – Neptune’s Spear is a more mid paced song covering an assassination team on their mission. The song has mostly melodic vocals from Billy except for the chorus where he growls menacingly “One Shot Kill” over and over. The song also has a really awesome guitar solo/breakdown in the middle of the madness. The instrumentation goes very well with the theme and lyrics of this song. Black Jack – Black Jack turns the speed up again to thrash level, but trades in a lot of the darker lyrical imagery we have heard thus far for a song about gambling and hanging out in Las Vegas. It’s cool to see Testament do a fun thrash song about partying in Vegas. Nice to see metal bands not be serious all of the time. Billy uses mostly shout/melodic vocals on this song accompanied by some awesome riffs and solos. Canna Business – Canna Business is another song with lighter lyrical content. The pace of the song is again more of a thrash level. The song is a celebration of the legalization efforts in the US for recreational and medical marijuana. Chuck yells “Cannabis is not a crime, Cannabis will set you free” among many other pro marijuana slogans throughout the song. Pretty straight forward and up beat thrash song about freeing the plant. Light it up and bang your head. The Number Game – They finish out their latest LP with The Number Game. The song opens with menacing sound guitars that build up to thrash ramming speed. The lyrical content is that of a serial killer who has not been caught and is on the loose. There is a nice break down in the middle of the song that slows the pace down. During this Testament add crushing guitars, awesome solos, and growling vocals. This is another one of my favorite songs. Billy’s vocals and the guitars fit this song perfectly. A fitting way to end the album. Testament keep their track record of putting out some of the best albums out of all their peers going. I enjoy most of their discography and this album is no different. Since they have started putting albums out regularly again they are always on my year end list. They were one of the best thrash bands in the 80’s and they are still one of the best playing that style today. While a lot of their peers put out watered down versions of what they used to be Testament is still tweaking and pushing their sound to different extremes. Their song compositions take a lot of twists and turns and they incorporate multiple styles of metal to back up Chuck Billy’s iconic vocals. Testament is one of those bands from yesteryear that you are glad still keeps pumping out the jams instead of hanging up their instruments and they prove that every album they release. This entry was posted in LP/EP/Single, Reviews. Bookmark the permalink.